Cardinal Seán delivered an excellent homily at last week's March for Life opening Mass about the changes we must all undertake to foster a culture of life. This week we celebrate our Catholic schools with Catholic Schools Week, and in doing so we remember the patroness of Catholic Schools, Elizabeth Ann Seton, who founded the first Catholic school in America in Emmitsburg, MD. "The first end I propose in our daily work is to do the will of God; secondly, to do it in the manner he wills it; and thirdly to do it because it is his will." I think Catholic schools teach this as their first lesson. Students of Catholic Schools uniquely learn that the daily work they undergo--whether it be science, english, or religion--is to God's glory. It is worth celebrating that we have such a strong network of Catholic Schools that teach children to do God's will, and to do their work in the way that God wills it be done. Father Flynn, from St Mary's in Lynn, MA, came into Mass yesterday with a group of students from St Mary's high school, and gave a wonderful homily on discerning God's will. 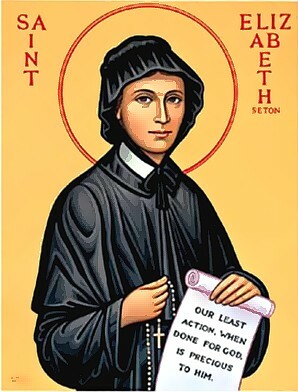 Check it out here, and, if you're a graduate of a Catholic school, take a moment to thank Elizabeth Ann Seton. This week, as we busily prepare for the 2013 Telethon here at CatholicTV, I'd like to thank you for your affirmation and support, and ask you to consider how you might be able to help us continue our important ministry. While we shouldn't presume our own merit, we also shouldn't fear what God has in store for us. Our fears of punishment from God often betray a lack of confidence in God, or a lack of confidence in our own love. But when we truly remain in love, we remain in God (1 John 4:16), and we have no need of fear. Paul offers us three theological virtues: faith, hope and love; not scrupulosity, fear and self-loathing. Let yourself love God and neighbor freely, and take some time to explore where your life is rooted. Do you act morally out of fear of punishment? Or do you act out of love in all things? Where do you remain? Loving perfectly can seem like no easy task, but in reality it is no task at all, since Jesus has already completed the task for us. By offering of himself and His Spirit, he has made it possible for us to exist in love, rather than making an effort to love. By acknowledging that he is the Son of God, we allow him to remain in us and root our lives in love (1 John 4:15). It can be hard to hear this simple message of hope through the noise of the everyday. We can allow ourselves to stray from love and move into fear when we get distracted by judging other people or by the judgments of other people, or by the well-meant, but sometimes misguided urgings of our friends and neighbors. This week I would like to talk about forgiveness. Now, I imagine that most of you can find it in your hearts to forgive someone who has caused you any type of pain. It is not always easy, but a great burden is lifted when you forgive someone and leave the hurt behind. To forgive is a blessing that can heal the world. What I am saying is please let go of the pain that you can cause yourself by being unable to forgive past transgressions. Reach out to those you may have hurt with love and understanding. Talk to God about your guilt, take a deep breath and live your life in a peaceful way. Forgive yourself and feel the love and comfort of God. You are not alone. In today's readings we hear from the first letter of John, in which he offers us the ultimate wisdom: remain in the Lord, and reap life from the Lord's annointing. John's attention to the dichotomy of deceit and truth in these verses and the verses around them serves to identify the truth with Christ, and deceit with the antichrist. Jesus not only offers us the truth; he is the truth. The truth we heard "from the beginning" must remain in us, but John has already told us (in 1 Jn 1:1) that Jesus is the Word of Life, and the Word (which is also referred to by the Church fathers as the Logos, Wisdom, and Reason itself) is "what was from the beginning". In other words, it is Jesus himself that must remain in us, in addition to the words he has spoken to us, because he is the Word that is spoken.